For coral reefs around the world, time is running out. That bad news for reefs is also bad news for the rest of the ocean and for humanity, since we depend on the planet's seas. One-third of the 3,863 reefs that make up the Great Barrier Reef — the largest, most extensive reef system in the world — went through a catastrophic die-off after a searing heat wave in 2016, according to a study newly published in the journal Nature. A bleaching event in 2017 devastated even more of that reef, and the cumulative effects have killed an estimated half of the magnificent system in just two years. The same devastation is hitting reefs around the world .According to some estimates, similar conditions around the globe have killed off about half the world's coral reefs in the past 30 years. The Great Barrier Reef corals were vulnerable because they've been subjected to warming oceans that are rapidly becoming more acidic. Those changes have been driven by human-caused greenhouse gas emissions, which are warming the world and causing Earth's climate to change faster than reefs can keep up. Reefs are stunning psychedelic wonderlands that snorkelers and divers love to explore — they're full of colorful shapes, swaying and branching creatures, and more. Reefs provide jobs for people in fishing and tourism industries, and they also protect coastal areas from surging seas. But perhaps more importantly, 25% of fish species spend some part of their life cycle in reefs, despite the fact that they cover less than 1% of the ocean floor. Losing such an essential part of the ocean environment could therefore have rippling effects that cause much broader collapse. As Michael Crosby, a marine scientist and the president of Mote Laboratory and Aquarium, told Business Insider for a recent feature on reef restoration, loss of reefs could have potentially terrifying consequences. But most importantly, the burning of fossil fuels has warmed the planet. And Earth's oceans have absorbed the majority of that heat, about 90% of it so far. As waters rapidly warm, corals lose the components that give them color and help them produce food, a process called bleaching. That slows their growth and makes them vulnerable to algae, disease, and death. Increased ocean acidification caused by the absorption of carbon dioxide causes bleaching, too. It's these bleaching events that have rapidly wiped out so much of the Great Barrier Reef. The same conditions can be seen in the Caribbean and other sites around the world. At present rates, it's expected that by 2030, 60% of all coral reefs are expected to be highly or critically threatened, and 98% of reefs will be exposed to potentially fatal conditions every year. 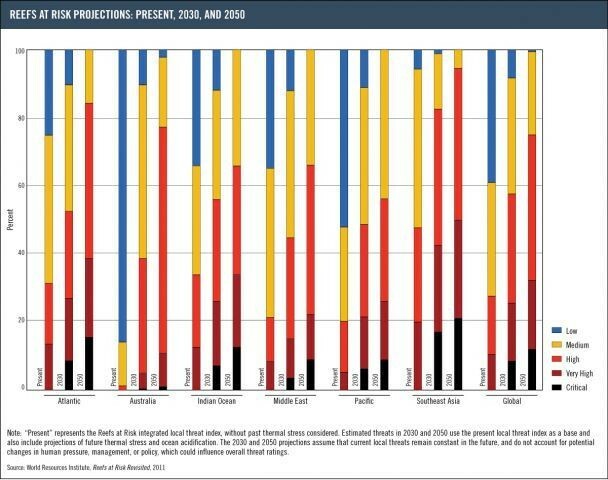 Reefs at risk between now and 2050. It's possible that coral reefs around the world could be mostly wiped out by 2050 or soon after. As the authors wrote in the recent Great Barrier Reef study, these processes are likely to continue — and they'll totally transform ocean ecosystems. "The most likely scenario, therefore, is that coral reefs throughout the tropics will continue to degrade over the current century until climate change stabilizes, allowing remnant populations to reorganize into novel, heat-tolerant reef assemblages," the authors wrote. In other words, reefs as we know them – and the habitats and greater ecosystems they support — will be gone. What'll remain are areas or corals that happen to be abnormally tolerant of heat or acid. But coral reefs overall won't be the same and whatever does survive likely won't be able to make up for the lost functions. A last ditch effort to save reefs? Around the world, scientists are trying to come up with ways to save reefs. Efforts include identifying coral that's particularly resilient to heat or acidity, and pioneering ways to quickly regrow coral so that dying reefs can be re-populated. Scientists involved in this work have achieved impressive results: in some cases they've recreating coral organisms that originally took a century or two to grow in just a few years. Other researchers are looking at ways to breed super-corals. On the Great Barrier Reef, researchers have been able to replant coral larvae in some sections after collecting eggs and sperm. But as demonstrated by the massive die-offs at the largest reef system in the planet, these sorts of efforts won't be enough to save the world's reefs without dealing with the larger carbon emissions problem. Individual efforts can't keep up when 50% of the world's biggest reef system dies in just a couple of years. As the researchers wrote in their new paper, the important question is when climate change could stabilize. If humans make that happen soon, more reef systems will be able to be preserved. Then — using these sorts of regrowing techniques — they could eventually be restored to some degree. But if climate change isn't stabilized soon, the authors wrote, "[t]he large-scale loss of functionally diverse corals is a harbinger of further radical shifts in the condition and dynamics of all ecosystems, reinforcing the need for risk assessment of ecosystem collapse." In other words, if we don't deal with the problem soon, we should think about what widespread ocean ecosystem collapse will look like and mean for humanity. In that type of scenario, cities will lose their protection against big storm surges, fishing and tourism industries could be eliminated, and the ocean may become largely lifeless or at least extremely transformed. As Crosby said, the consequences from that bleak transformation could be more severe than most of us can imagine.